Here, the uptrend in GLD started on July 28, 2010. The Money Flow Index peaked on September 31. Using an equal time projection, the Money Flow T™ suggested that the energy of the move in GLD would deplete on December 7 which was an accurate forecast. It’s important to remember that sometimes, the end of a Money Flow T™ will result in a trend change. Other times, as here, it will result in a period of consolidation that could lead to either a trend resumption or a trend change. 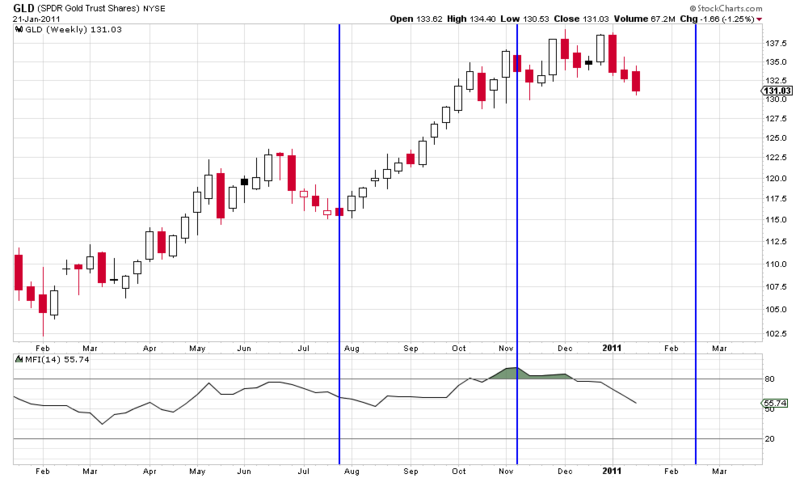 Moving to the current GLD forecast, we will examine a GLD weekly chart. Any time symmetry technique that works on one time frame should work on all time frames. In other words, Money Flow Ts™ are fractal in nature. 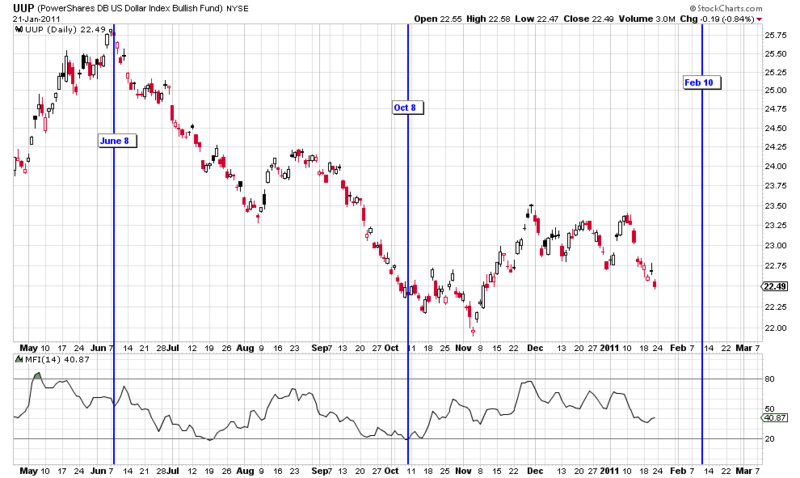 Here we use a Money Flow Index peak in early November as the center post with the same starting date in late July. The Money Flow T™ is projected to end in mid-February. You’ll notice that the Dollar Money Flow T™ is inverted. It uses a low in the Money Flow Index as a center post to project the end of the energy of a down move. As you can see, from the start of the move to the Money Flow Index peak projects an energy depletion in the second week of February. That’s it for this week. 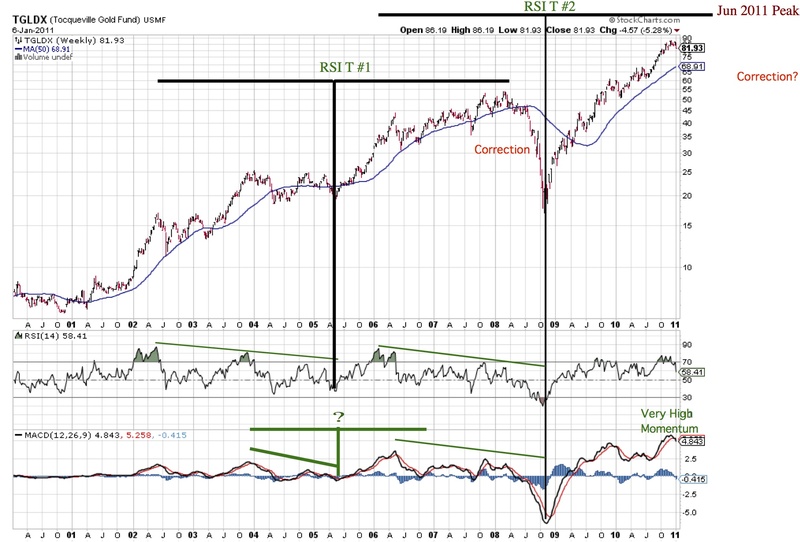 Next week, we’ll take a look at Bonds.The analysis will focus on high yield bonds vs high quality US Treasuries. As always, please use caution in your investments and manage your risk wisely. For the next few months the Money Flow T™ concept is the key project for Parker’s and Terry’s research activities at T Theory Foundation. Consider Parker’s weekly postings here as our most significant new Tutorials and try to better understand them by exploring areas of special interest to you. You can duplicate the Money Flow Ts™ charts with a subscription to http://www.stockcharts.com, but you will need to read the stock charts tutorials on how to place the verticle lines in a time symetrical pattern. 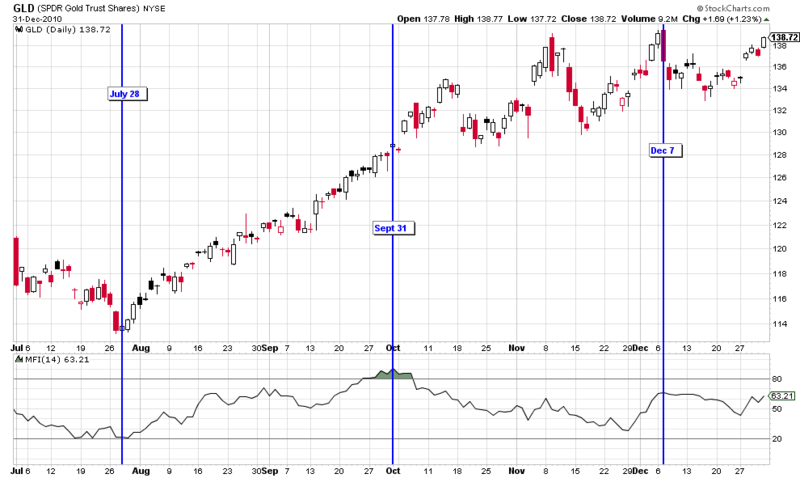 Can you increase the odds of determining when a trend will either: 1) reverse, or 2) enter a consolidation phase? 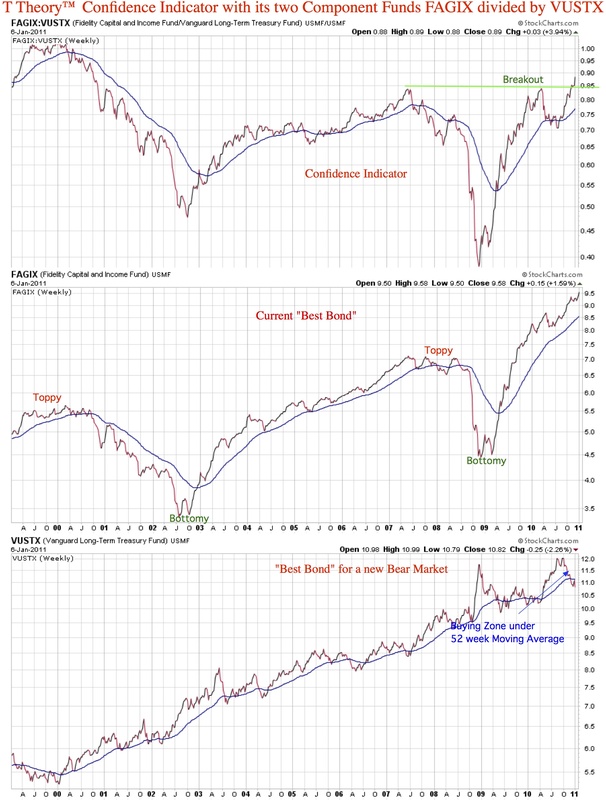 In working with the Money Flow Index, I discovered that often during a strong up (or down) trend, the Money Flow will peak (or bottom) in the middle of the move. Accordingly, if you properly define the starting point of the move, I have observed that you can frequently anticipate when the energy of the move will deplete. I call these “Money Flow Ts”. The Money Flow Index is a momentum indicator which measures the strength of money flowing into and out of a particular security. It is based on a security’s typical price, which is that period’s high, low and close divided by three. The typical price is multiplied by the period’s volume to determine raw money flow. Then a ratio is constructed comparing the positive raw money flow in periods where the typical price increased with the negative raw money flow in periods where the typical price decreased. The standard number of periods used for comparison is 14. As you can see, the Money Flow Index peaked on March 17, after which the S&P continued to advance while the Money Flow Index retreated. So, 1) placing the center post on March 17, and 2) starting the Money Flow T on February 5 when the up trend commenced, projected that the energy of the move would end on April 26. Not only did the energy of the move deplete, but the trend reversed on that day. 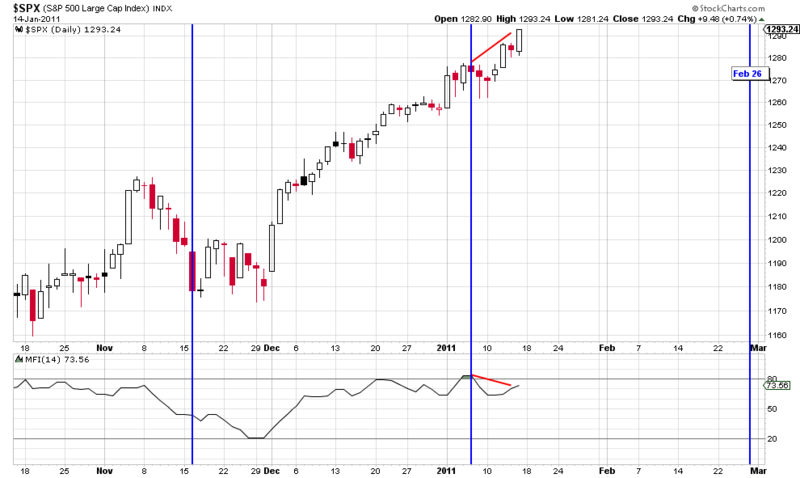 The current up move in the S&P started in November. 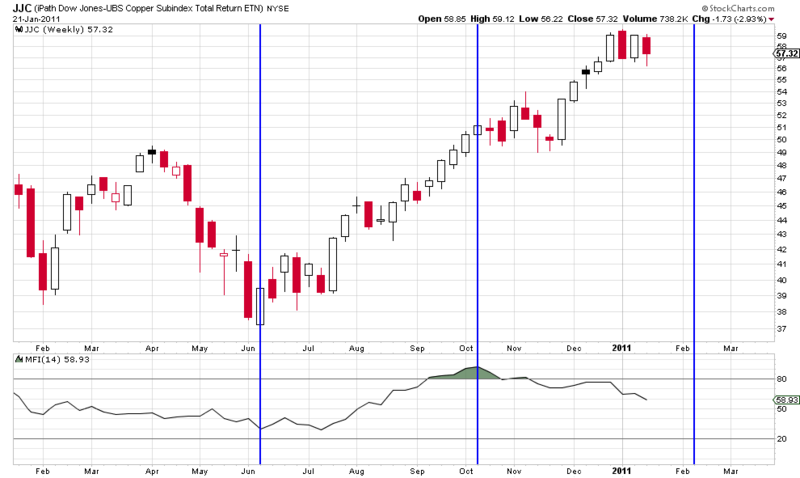 As shown below, the Money Flow Index recently peaked on January 6, and has started to retreat while the S&P broke to new highs for the trend as of Wednesday, January 12. Using January 6 as a center post and November 16 as the earliest possible start date for the Money Flow T projects an end to the energy of the move on February 26. There are two caveats to this analysis. First, there is plenty of time between now and the end of February for the Money Flow Index to make a new center post of an even longer Money Flow T that would project an end to the energy even later. Second, November 16 is the most conservative choice for the start of the Money Flow T. One could argue that the move did not begin until November 30. 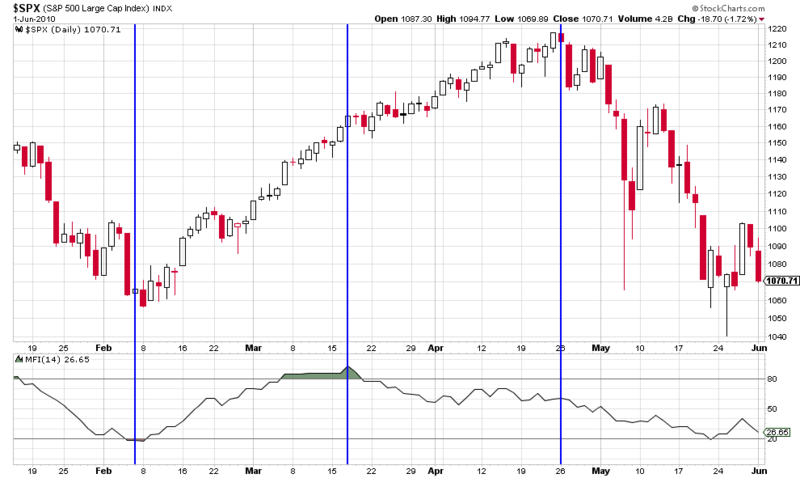 From a practical perspective, all this two week disparity in potential starting dates means is that you would be on the lookout for a topping pattern in the two weeks leading up to February 26. All of the Money Flow Ts depicted on this chart use November 16 as a starting point. The blue lines use a Money Flow peak center post on December 13 to correctly project an energy depletion on January 6. You will notice that we did not get a trend change. 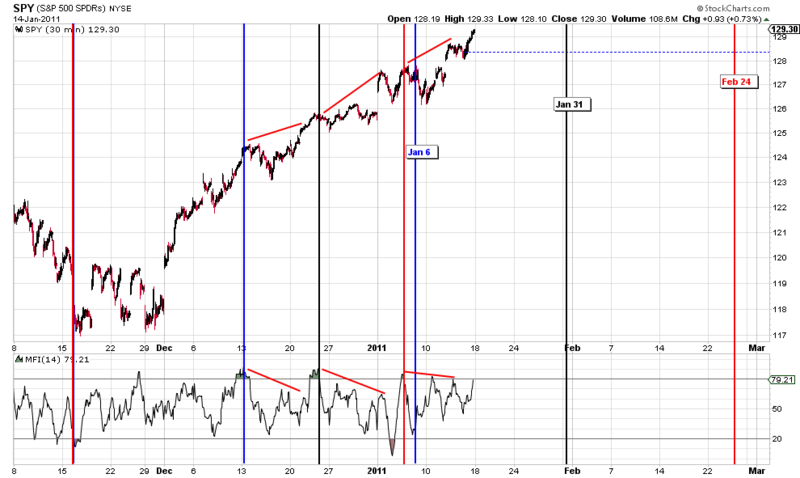 Rather, the trend simply took a breather for a couple of days. The black lines use a Money Flow peak center post on December 23 to project an energy depletion on January 31. The red lines use a Money Flow peak center post on January 5 to project an energy depletion on February 24, which coincides with the projection we saw on the daily chart. A couple of notes. First, today, we got another spike in the Money Flow Index which could serve the basis for another center post of an even longer Money Flow T if the S&P continues to advance while the Money Flow Index starts to retreat. Second, no methodology is 100% accurate all the time. Please use caution in your investments and manage your risk wisely. This entry was posted on April 17, 2013 at 10:18 AM and is filed under . . . T Theory®. You can subscribe via RSS 2.0 feed to this post's comments. You can comment below, or link to this permanent URL from your own site.